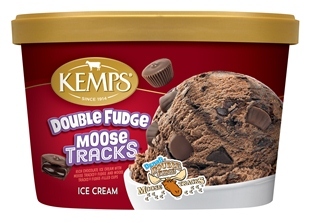 Rich chocolate ice cream with Moose Tracks fudge and fudge filled cups. A chocolate lovers dream come true! MILKFAT AND NONFAT MILK, SWEET CREAM BUTTERMILK, MOOSE TRACKS FUDGE(R) (SUGAR, VEGETABLE OIL [PEANUT AND/OR COTTONSEED AND/OR PALM], COCOA PROCESSED WITH ALKALI, WHEY, SOY LECITHIN, SALT, CORN STARCH, NATURAL FLAVOR), HIGH FRUCTOSE CORN SYRUP, SUGAR, FUDGE CUPS (SUGAR, COCONUT OIL, COCOA PROCESSED WITH ALKALI, PEANUT OIL, SKIM MILK, MILK, WHEY, SALT, SOY LECITHIN, NATURAL FLAVOR), CORN SYRUP, COCOA (PROCESSED WITH ALKALI), WHEY, CONTAINS LESS THAN 2% OF MONO AND DIGLYCERIDES, GUAR GUM, CALCIUM SULFATE, CAROB BEAN GUM, CARRAGEENAN.